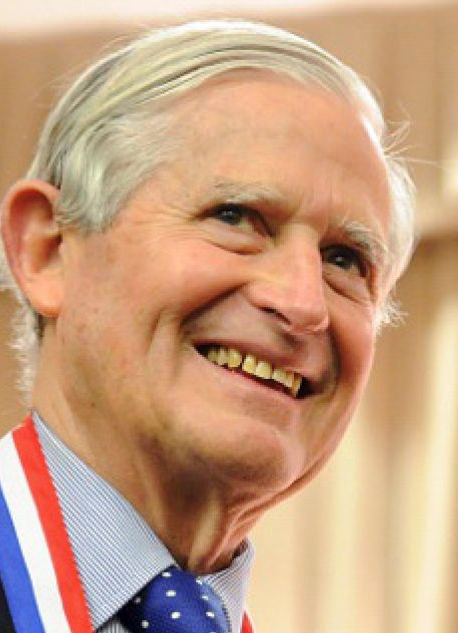 The Museum Association mourns the passing of our longtime Board Chair, Jimmy Coleman. Coleman came to the Museum Association through his service on the Coast Guard Foundation Board of Trustees. In addition to outright philanthropy toward the Capital Campaign, he took the decisive step of purchasing Union Station adjacent to the Museum site to facilitate the permitting and construction process. Born and raised in New Orleans, Coleman was educated at Princeton and Oxford Universities prior to attending Tulane Law School. He then pursued a career in law and real estate development. Coleman is survived by his wife, Mary, and son, Jamie. The Museum Association expresses deepest sympathies to the entire Coleman Family. On behalf of our Board of Directors, we are saddened by the passing of a great leader and champion for the Museum, Jimmy Coleman. Our heartfelt condolences go out to the entire family of our Chair Emeritus. Jimmy often visited the site for the future National Coast Guard Museum and commented on the spectacular views down the Thames River. The museum has been designed to maximize the visitor experience inside while connecting with the maritime community just outside the doors. 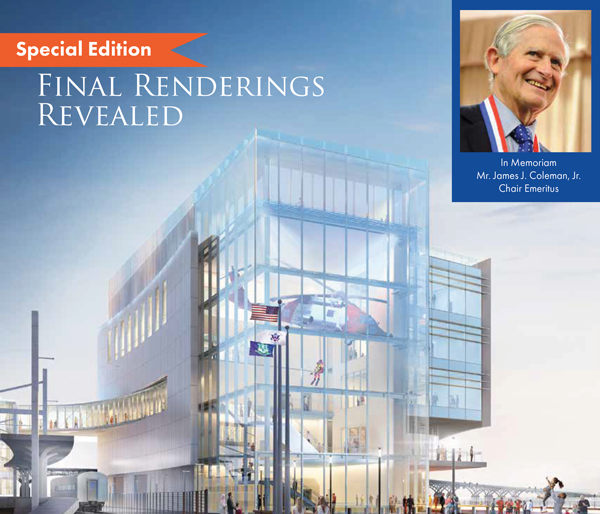 After fine tuning the facade, the Museum Association is proud to share the final rendering. The sails motif on the river evokes the heritage of our Service and the first floor balcony and fifth floor memorial terrace will host memorable, thought-provoking events. We are closer than ever to achieving our shared vision of engaging, educating and inspiring the visiting public. In order for that to happen, our team is critically focused on raising the funds needed each of the next three years. Our team is working diligently to ensure the project is shovel ready this year and that funding keeps pace with that progress. Now, more than ever, we need your help to raise awareness of the importance of the Museum coming to fruition. Key Museum project stakeholders were inspired by an update presented on the eve of the 2019 State of the Coast Guard Address in Long Beach, CA. The group, who heard remarks from Admiral Karl L. Schultz, Commandant of the USCG, included Coast Guard veteran and leadership donor, J.D. Power III, along with several family members. Updates regarding the design development of the Museum and the exhibits were accompanied by several conceptual renderings, including the J.D. Power III Polar Operations Gallery, which will appear in the Champions of Commerce Wing on the Power Family Stewardship Deck. Power’s service in EASTWIND inspired the gift naming and her father’s passion for the service informed Susan J. Curtin’s decision to follow in his footsteps and serve in the Coast Guard Reserve as a Port Security Specialist. The March 20 event, held at Parkers’ Lighthouse in Long Beach’s Shoreline Village is the first public event for Curtin as the Museum Association Board Chair. In his remarks, Admiral Schultz left no doubt as to where he stands on the Museum project. Schultz went on to give a history lesson through the lens of the other vessels that will dock alongside the new cutter named for Coast Guard heroes like FORREST REDNOUR and BENJAMIN BOTTOMS. “Forrest Rednour rescued 133 sailors on board U.S. Army transport DORCHESTER 76 years ago when it went down in the North Atlantic.” Schultz went on to speak of Benjamin Bottoms who was the radio operator for the Grumman Duck float plane launched from the Cutter NORTHLAND that went into Greenland to rescue an Air Force bomber that went down. The third vessel, the Cutter ROBERT WARD, recently commissioned in San Francisco, was named for a coxswain in charge of a landing craft on June 6, 1944 in the first wave of the Normandy invasion. S1 Ward distinguished himself by rescuing two other landing craft crews under heavy fire. “These are the kinds of heroes that exist in the storied history of the United States Coast Guard. If you don’t go looking for that kind of information, you never hear about It.” Schultz said. View of the Museum from the Thames River with the USCG Barque EAGLE at it’s new home port. In March 2019, the middle phase of the architectural process, known as design development, was completed by the project design team, which includes architects, engineers, the pre-construction firm, estimators, Museum Association staff and our owner’s representative. The purpose of the design development phase is to refine the concepts developed during the schematic phase with considerations for the most efficient construction methods and value engineering. The improvements to the design include a refined approach to the sails motif on the water side of the Museum, which yielded an opportunity for an overlook balcony facing City Pier and the Thames River. The atrium, which will feature the iconic Coast Guard rescue helicopter, was adjusted to facilitate the entry flow for visitors and increase the connection to other waterfront amenities in the area. The majority of the development of the design took place on the inside as the pre-construction team has gained further insight from collaborating with the exhibit design firms contracted through the Coast Guard. Taking into consideration the preliminary layout of macro artifacts such as surf boats, Fresnel lenses, various simulators and other large assets, the team conformed the exhibit floors to meet load requirements. Iconic Coast Guard rescue helicopter hangs in the atrium over the Museum’s entrance on City Pier. In the final design phase, detailed construction documents for the 80,000 square foot museum will be completed. That process is expected to be concluded this fall. Additional views of the future Museum are available on the renderings page. For more information about the visitor experience, check out our exhibits page. Senate Appropriator Chris Murphy (D), with strong collaboration with Senator Richard Blumenthal (D) and Congressman Joe Courtney (D), continues to ensure that the anticipated $30 million in Federal funding for the Museum gets appropriated as the project experiences strong momentum. In March, the Department of Homeland Security Appropriations Bill was signed into law by President Trump, and it included $5 million in support of the exhibit designs. This brings Federalsupport to $10 million and the overall total for the When the Most is Expected Capital Campaign to more than $47 million. “We are grateful for the continued support of the Federal government, but the most important element in the DHS bill ensured that active duty men and women and their families received their paychecks, rather than needing to rely on food pantries and other forms of assistance,” commented CAPT Wes Pulver.